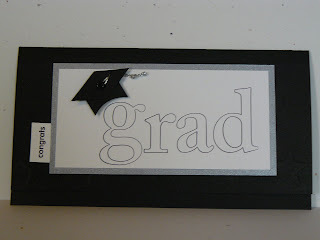 This card is a different take on a graduation card. Kind of whimsical, I think. We will be making this card at stamp club on Monday. It's a fairly simple layout that could be easily altered for other occasions. The graduation cap was made using punches. Look at the next post for a picture tutorial of how it was made. The instructions are not my own creation, I found the idea off of SCS, but in a written form. I think seeing it shows how very simple making these caps are. I hope you'll agree. 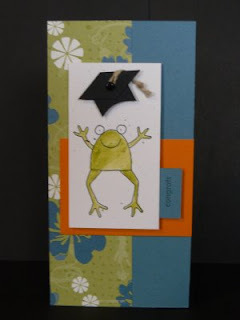 This card (created by my downline, Jen) is another great example of how to use the graduation hat on a card. We made this at stamp club this past Tuesday. It uses the Outline Alphabet stamp set.